As expected, Google has taken the wraps off the Samsung Gear Live smartwatch running Android Wear smartwatch OS, and will be available to buy later today via the Google Play Store. 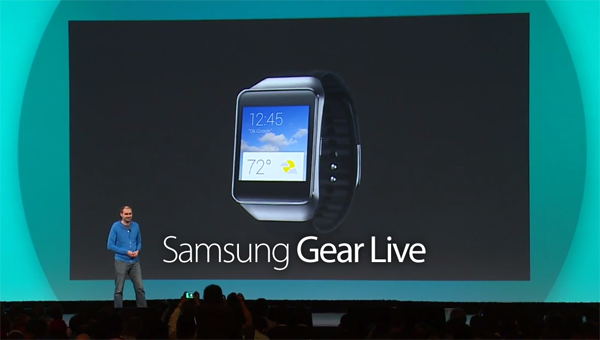 Samsung tried to get the jump on its big-name competitors by joining the smartwatch game early, but with the inaugural Galaxy Gear having been panned by critics following its roll-out alongside the Galaxy Note 3, the subsequent efforts showcased at Mobile World Congress have scarcely fared much better. 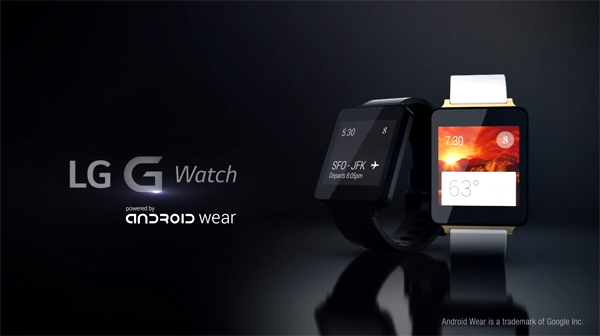 Today, with I/O in full flow, the Korean outfit has introduced Gear Live, which will run on Android Wear, and although it looks very similar to the Gear 2 in terms of form factor, the potentially richer experience of Google’s software should render the Gear Live a much more appealing prospect. Even though Samsung has remained dedicated to its smartwatch endeavors, its releases so far have been abject. The aforementioned Galaxy Gear was bulky, functioned terribly, and had a battery life that simply couldn’t cope with the demands of the modern digital consumer. The Gear 2, which arrived at MWC alongside the Gear Fit and runs on Samsung’s own Tizen OS, is a marked improvement on its predecessor, offering better battery life and a sleeker finish, and with the Gear Live looking like a rebrand of that April release, those who wanted the Gear 2 on Android Wear have essentially gotten their wish. Unfortunately, though, details on the Gear Live are currently at a premium. We presume it will offer a similar list of technical specifications to the Gear 2 given the uncanny likeness to Sammy’s current flagship smartwatch, but until such time as this information is revealed, we can only speculate. But it’s confirmed that the Gear Live will sport the very same display as that of the Gear 2, a 1.6-inch panel, and to top things off it’s water resistant, a big plus for those who are always out and about. Interested parties will be able to preorder the Gear Live from the Google Play Store later on today, although with no details on when it will ship, it’s unlikely that many will be rushing to make an investment. When Google first unleashed Android Wear, both LG and Motorola took the wraps off the G Watch and Moto 360 respectively, and while the former will also be available to preorder on the Play Store today, there’s also no word on when exactly it will hit the retail market. The Moto 360, which many of our awesome Redmond Pie readers took a bit of a shining to, will be available later on this summer, although as yet, is not up for preorder. Whether Samsung’s decision to piggyback Android Wear is an early signal of Tizen’s demise remains to be seen, but while the Galaxy maker continues to keep faith in a platform that one analyst declared as being "dead in the water," it appears somewhat inevitable that Samsung will instead wind up playing to its strengths and sticking to the hardware game.